Arlington, TX is known for its entertainment venues and business-friendly environment, and vehicles play an integral role in that culture. In 1953, a General Motors assembly plant came to the city, and today remains the only GM SUV plant in the United States. Early transformation of the city from an agrarian center to a large suburb were spurred by the transportation industry, and particularly the assembly plant. Its business-friendly atmosphere stems from the 5,500 acre Industrial District known as the Great-Southwest Industrial District, built in 1957 by real estate tycoon and founder of Six Flags Amusement Park Angus Wynne, Jr.
A noteworthy point in the history of Arlington, TX is the 1957 opening of the Dallas/Fort Worth Turnpike, known today as Interstate 30. This helped connect Arlington to the larger communities of Fort Worth and Dallas, making the commute much easier. The Arlington Municipal Airport opened in 1962 and brought air travel to the area. As Arlington grew, so did its businesses and industries, and so too did the need for advertising those businesses and industries. We are happy to continue a tradition of entertainment and business in Arlington, TX by helping spread eye-catching messages and advertisements wherever you may drive. If you’re interested in vehicle wraps in Arlington, TX, let Metroplex Wraps go to work designing the perfect graphic for you! Our professional design team can help find the perfect graphics or build one from scratch exactly to your specifications, bringing your vision to life. 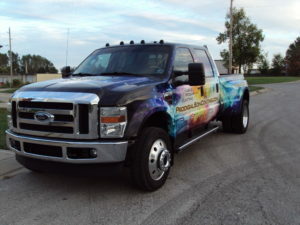 A vinyl wrap will offer additional protection against damage, weatherization, and vandalism while adding vibrant, unique color and images that can even extend beyond the painted surfaces of your vehicle. Give us a call today at 817-997-4431 .